Located in the beautiful Ottawa Valley, halfway between North Bay and Ottawa there is a town called Deep River. 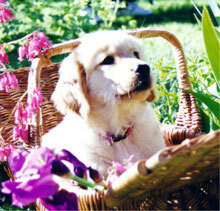 This is where we reside with our beautiful Golden Retrievers and Arabian horses. Our puppies are the result of a careful and selective breeding program, only hip, eye and heart clear dogs with a friendly and outgoing temperament are used for breeding. We have been involved in this breed since 1988. Training and showing dogs in both obedience and conformation.